I've been going to see an optometrist every year for most of my life. This experience was definitely the most thorougheye exam I've ever had! Dr. Mark Hovander was born and raised in the Seattle area. 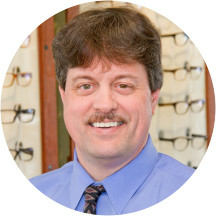 He attended Western Washington University and received his Doctor of Optometry degree from Pacific University in 1989. After graduation, Dr. Hovander was honored with the Irvin M. Borish Award for Excellence from the American Optometric Foundation. Returning to Seattle he established his professional practice in conjunction with his father, Charles Hovander, a well respected contact lens specialist. Dr. Hovander is a member of The American Optometric Association and the Washington Association of Optometric Physicians. He is strongly committed to quality comprehensive patient care. Having performed over 40,000 eye exams during the past 23 years Dr. Hovander's thoroughness and attention to detail has remained unchanged. Very excellent and professional doctor! Dr. Hovander is very kind and thorough. He has an excellent bedside manner and did a great job answering any question/concerns I had, as well as explaining everything he was doing for my eye exam. His assistant were also very helpful and informative. Patient before me was a bit chatty so that was the real reason my appt was delayed, probably would have been seen immediately (on time) otherwise. Dr Hovander and his staff are awesome. Everyone was competent, prompt, and meticulous. That'spretty much all I care about so got full stars from me. I got my prescription (glasses and contacts) then filled it elsewhere though so can't comment on the frames service in the front. Always very thorough and knowledgeable. I thoroughly enjoyed my appointment with Doctor Hovander! He was very helpful in answering all my questions and explaining things thoroughly. All the tests were very straightforward and were helpful. I really enjoyed the visit and would definitely come back in the future. Very patient and gracious. Informative and more than willing to answer questions. Thorough and competent exam. Felt very comfortable. My appointment was quick and to the point, and my doctor(s) were wonderful. They were helpful, knowledgable, and very attentive. Highly recommend. Dr. Hovander is among my favorite providers. He was very prompt and polite. He was also very thorough and tried to answer my questions. The most thorough exam I've ever had, with plenty of explanation of what he was doing, why, and the results. Even better was my time with Paul, who spent well over an hour helping me find the perfect frames for my face and coloring. He's truly an artist! I have seen Dr. Hovander for a number of years. He is always very professional, and his staff are great! Mark Hovander has been my primary eye care doctor since I moved to Seattle in the 1990's. He is still as calm and patient as in my first visit, explaining each test, the results of the exam, and any changes since the last visit. I recommend him highly. Dr. Hovander and the other staff at University Vision were really professional. When I arrived, I immediately was given the paperwork I needed to fill out and everything was clearly explained. During the eye exam, Dr. Hovander told me everythingthat he was doing while he was doing it, and explained its purpose, which I appreciated since obviously as a patient I have no idea what's involved in optometry. Very thorough and detailed. He ran by every step he was doing and performed a lot of checks to ensure my eye health is right. Dr Havander always explains everything and I never feel rushed during my appointments. His staff is always friendly and helpful. Very nice, explained everything he was doing and why, good quality optometrist! Dr. Hovander was very informative and patient. I was delighted to meet him. Dr. Hovander is extremely thorough and a consummate professional. He makes and keeps copious notes, allowing him to track the overall health of my eyes. Best ophthalmological experience I've ever had! Absolutely everything is explained to you and everyone takes the time to make sure your needs are met and that you're getting the glasses you need. The eyeglass fitting experience was superb! Great Doc, great staff. They go the extra step to ensure you have the absolute best prescription for your eyes. I have been seeing Dr. Hovander for over 20 years. When I moved to Vancouver, I traveled to Seattle, so that I could continue to. He is careful and patient, explains everything he is doing and why, and he is alwaysfamiliar with my eye care history. Everyone in the office is professional and friendly. I recommend him highly. This is an excellent clinic. As someone who has been having eye exams for over thirty years, I am very impressed! The exam is extremely thorough and the interaction with the patient is very professional. Excellent practitioner, answers questions well, methodical,calm and gentle.I highly recommend him. Dr. Hovander was wonderful, and most of all, thorough. He did the normal thing with the flipping lenses in front of you and asking you "1 or 2", but then he took it a step further and made a mock pairof glasses to test your distance vision, and your near vision, and your balance. And this was on top of checking pressure and nerve health equally thoroughly. You could tell he really cared about taking his time to get the prescription exactly right, and the prescription I got from him is the best I've ever gotten. That being said, I didn't really like his opticians. They really put off the vibe of used car salesmen, and the frames I got were slightly more expensive and much lower quality that my previous frames. I'll probably go elsewhere for frames in the future, but Dr. Hovander himself is fantastic. Dr. Hovander is OK. Decent and efficient. The clinic seems messy and cluttered, which doesn't change the quality of the exam, it just feels not great while you are in there. However, beware of the contact lens person- Richard. He'll tryto sell you boxes of contact lens' and if you don't buy them, and he gets a call from an entity online you do buy them from, he'll call you and harass you about it and not give them your prescription! I had to file a complaint. I have seen him for 4 years and I am always satisfied with his service. He is very through, considerate and kind. Doctor was great and the guy who helped pick out frames was very willing to spend as long as it took to get frames that worked. He seemed to care very much about the quality of the frames they ordered and had in stock. Dr Hovander was very professional and supportive during the visit. I am squeamish about eye care and he was great in making me feel comfortable. I appreciated Richard Ackerman's efficiency and expertise as well. Overall friendly and competent office. Dr. Hovander is always very thorough and professional. Great eye doctor! I've been going to this office for a few years and have been very pleased with their professionalism and service. I had been having difficulty with eye strain and dr hovander did a thorough exam, explained all the results and issues with my eyes, and solved my problems with the right prescription! Two days of no eye strain and way betterdistance vision. I wish I had seen him a year earlier! I've been a patient of Dr. Hovander for almost two decades. When I moved hours away for six years, I traveled to his office to have my yearly exam. I've always had exemplary care here. Dr Hovander has been my Optometrist since 1999. He always gives excellent care, explains what he is doing, and answers my questions. Richard, Paul, and Lisa complete the team. Paul spends time getting my glasses to fit and look just right. Thank you! Very thorough and careful doctor. I appreciated his calm and considerate manner. Best OD I ever been to - thorough and attentive! I've seen Dr Hovander many times. He's always thorough, courteous and patient. This is an excellent full-service office, and the entire staff is knowledgeable and skilled. Dr Hovander is so good. He always checks with prior assessments to make sure you understand how your eyes are changing. He also makes sure the prescription he determines is the way you want to see in the real world, testingit by having you look down the street with a demo pair of glasses. Very professional staff. Everything was clearly explained. I really liked being able to complete all of my new patient paperwork online prior to my appointment. I've gone to Dr. Hovander for 21 years. Yup, 21 years. I find him thorough and thoughtful. He takes time to do my annual exam, and when I've needed care for something urgent (eye inflammation, etc), his office has gotten me in quickly. Mark Hovander is a fabulous doctor. He takes time to explain what he's doing and why. He also gives option if there are issues and explains those and the effects one might expect. Great man! Mark seems like a nice and capable doctor. But their front desk refused to give me my pd rating along with the prescription. I can understand their desire to try and preserve their own line of glasses for sale, but Ijust paid for my eye exam. Holding my pd hostage isn't going to cause me to change my mind about where I buy my glasses. The front desk guy was quite rude about it. I've never been denied that piece of information from an eye doctor. Now I'll need to figure out how to get that piece of the prescription on my own. Dr. Hovander was excellent in his thorough (and patient) eye exam of my 92 year old mother. Thank you! Does a great job of explaining what he is doing and what you can do to help yourself.